The Tot Testers are getting quite excited for the World Cup, and lots of companies obviously are too. 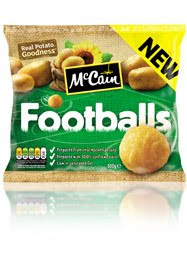 They've been trying McCains Footballs to see what they think of this chip alternative. Its always a struggle to get the Tots to eat anything which doesn't look like a chip- to the point where Sunday roasts are known in the Family Panel house as "Big Fat Chips." The novelty of these meant that the Tots were less suspicious of them, and Big Tot loved that she could run them around the plate. Another thumbs up was that they're big and chunky enough to make it easy for her to put the fork through them, as she is still learning the idea of using a knife and fork. And they were also a handy enough size and shape for Little Tot to hold one in his fist from plate to mouth without dropping them. They look like a cross between Potato Croquets and regular chips, and are easy to cook just like a normal oven chip product, although they do take a little longer to make the outer go crispy if that's the desired taste. The McCain Footballs are suitable for Veggies too, and get crispy because they use Vegetable oil on the coating. Well they taste like potato with no seasoning-hardly surprising when they are made with no added salt. Peace of mind wise they are nutritionally a better option than other aimed at children potato product. They do taste a little bland though for an adults taste- we preferred the Rustic Chips we tried previously. However, when a little salt and pepper is sprinkled over, they taste fine. They definitely are there for child novelty value and to make sure that salt and flavorings are kept at a dinnertime minimum. You are never going to stop a child preferring chips to mash, but Footballs are a happy medium.